This post will be on top of the blog for a while. New material appears beneath it. — Vancouver, Simon Fraser University downtown, Jan. 17, evening. — Los Angeles, UCLA Lewis Center, Jan 19, 6-8 pm. — Washington DC. National Building Museum, Feb. 9. We welcome other suggestions for events, ideally fitting my travel schedule (which is evolving in the third column, under my photo). The email link is there as well! 17 Responses to book is ready! events being planned! Ordered! It’s a shame I no longer live in Vancouver. This seems like the perfect time to mention, though, that your blog is at least partially responsible for inspiring me to move to Amsterdam to do a masters in urban studies. Thank you for doing what you do! Also, you can feel free to come to Amsterdam to speak with my colleagues and me! Looking forward to the event in DC. I hope to be there. Toronto requests your presence – maybe some time between Vancouver and Washington DC? It’s the National Building Museum. And it’s a fabulous venue. Can’t wait for it. I second the Minneapolis suggestion, and happen to work at a local bookstore that would be happy to have you, if you prefer to go that route (as opposed to a more directly academic/institutional event). I really wish I could attend the Building Museum event (definitely one of my five favorite places in the city) but I don’t get to return home to D.C. for another 5 months! You should definitely come to Boston in the meantime though. I hope this tour is a BIG success. Congratulations! 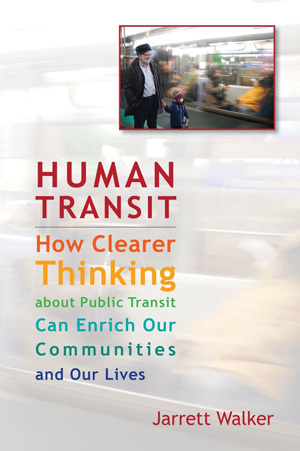 Barnes and Noble has started shipping “Human Transit” books Thursday. I received the book in the mail from Amazon two days ago (the 21st of December), in San Francisco. Thank you! Mine also arrived in time for Christmas. Such a practical and pragmatic approach, as always. Loving the little tram/trains; took me until chapter four to notice the wheels, so kudos to the designer! I got the book today-Dec. 23rd in Montana. Merry Christmas! I got my book today, and I’m looking forward to attending the Building Museum talk. See you then! Any prospect of an ebook? I searched for the title in both Amazon’s Kindle store and Apple’s iBooks store, but not find it listed either place. There's definitely going to be an ebook! Check the Island Press website, where it will probably be for sale first. May this tour will be a great success along with your book. Home › General › book is ready! events being planned!